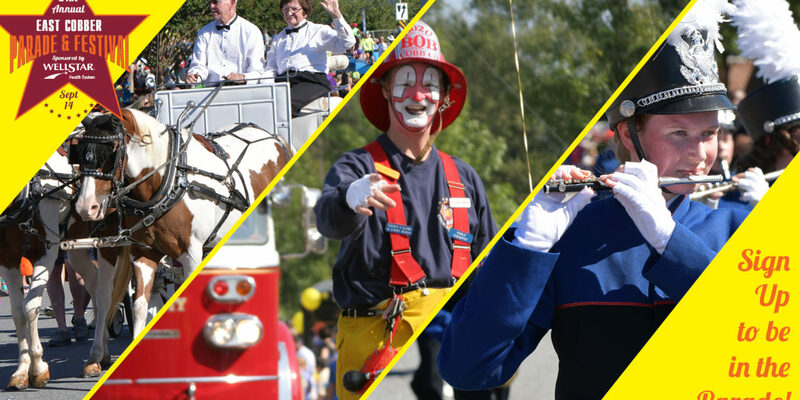 This year’s 24th Annual EAST COBBER Parade will be held on Saturday, September 14. We welcome your participation in making this year’s EAST COBBER Parade another fun and successful community event. The 1 mile EAST COBBER parade will step off at 10am in front of the Princeton Lakes subdivision entrance on (1223 Johnson Ferry Road), travel south on Johnson Ferry Road, and turn left onto Olde Towne Parkway. The EAST COBBER Festival will be located in the south parking lot of Johnson Ferry Baptist Church immediately following the EAST COBBER parade. From 11am—3pm, the free Festival will feature arts and crafts, local businesses, food concessions, carnival games, and an entertainment stage. The Parade Application must be completed and submitted to the EAST COBBER by August 2, 2019. Letters assigning your place in the parade will be issued by September 4. There is no fee to participate in the parade if you represent a non-profit, school or church. Local businesses can participate as a “Parade Patron” for a $300 promotional fee. NextJOIN THE FUN! RESERVE A FESTIVAL BOOTH! Since 1993, the EAST COBBER Parade & Festival has grown into East Cobb's most popular hometown tradition. Click the information below to participate in the 2019 Parade and/or Festival. > Volunteer Signup - available soon!